Complete booking management with business rules, loyalty, identity and promotion modules. New marketplace for direct leads and revenue. Docusign services for cc verification with 100% protection. Start today! Make better decisions with Transaction Risk Analysis. Identify your customer with contact validation, Intent verifications and Data enrichment. VCI score will allow customer to access and enter credit card information. Complete Order Validation with VCI information cross check allows to validate customer transactions and process valid transactions. 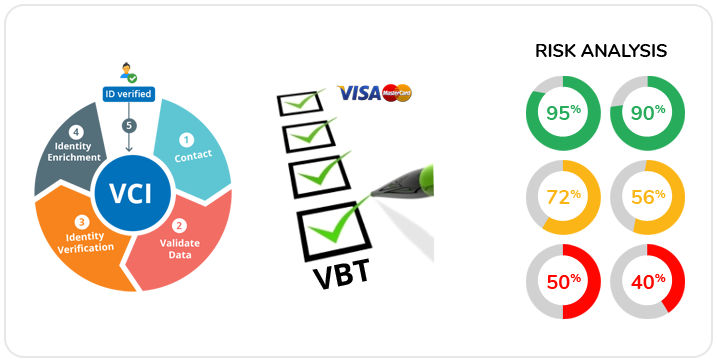 VBT score authenticates booking risk analysis and completed transaction into GDS systems. We integrate identity and transaction verification directly into Booking engine. **Disclaimer: Product names, logos, brands, and other trademarks featured or referred to within Tripsolver products and services and within tripsolver.net are the property of their respective trademark holders. These trademark holders are not affiliated with Tripsolver Inc, our products, or our website. They do not sponsor or use of them does not imply any affiliation with or endorsement by them. * API or XML integrations are services to support Tripsolver software and all integrated brands or companies have no connection with Tripsolver software or endorse in any way with the data used or workflows developed as part of Tripsolver software. Tripsolver Inc works with Service providers, GDS systems and Payment/Retail vendors in providing value services to clients.